I had an email through yesterday, telling me this P.C.E. would be streamed live and so it is that at 11.00 C.E.T. (10.00 B.S.T.) I’m waiting for my first IATEFL Harrogate experience to begin unexpectedly early! Happy days, as I was disappointed not to be able to attend one of the P.C.E.’s in person this year. I first discovered Adrian Holliday during my M.A. ELT studies at Leeds Met last year – The struggle to teach English as an international language featured, as did a chapter in an edited book from Routledge about Applied Linguistics that I read, not to mention the journal articles. He comes across very strongly in his writing – a man with opinions, which he isn’t afraid to express! So I was delighted to discover that I have the opportunity to watch him talk via the live-streaming despite not being able to attend the P.C.E. day. Adrian says he has never thought of himself as a technology person but does like technology, and is happy to be here in his home area, able to eat in Betty’s restaurant, and to have had a good night’s sleep! The topic connects with something he is very interested in – cultural travel and claiming the world. What tech does is bring out something that has often been hidden. Web-based and digital tech liberate a world that has been hidden. “Young people on the march” – teachers in Iran can’t cope, there are so many youn people learning language and they are way ahead of their teachers. Inspiring but can be worrying if we don’t allow things to open up. This is what this talk aims to do. Holliday cites a secondary school in Hong Kong, demonstrating the power of technology to reach students, then a Sri Lankan secondary school with American textbooks with glosses scribbled in by learners that characterise their interests. They write their own script onto the dialogue. They convert what they get, out of sight of the teacher. He speaks of the amazing creativity of university learners in Kuwait and then inner-London secondary schools in the UK, where students play with each others’ languages, demonstrating incredible skill, and Chinese secondary school students’ diaries again demonstrating immense creativity. Teachers may think learners lack autonomy, but in fact learners may practice their autonomy in private by themselves. Holliday believes that everybody has the innate ability to be autonomous and that people practice it privately, but that it is not always visible in the classroom because the classroom doesn’t allow it to work. He provides an example of technology bringing creativity and choice into the language learning environment, making it visible where it was hidden and secret. He is strong in his views that British or American models should be moved away from, but accepts that learners may choose them as not the core but something exotic. They are attracted by the “brand”. He says it becomes in the domain of motivation rather than that of model. When we think about technology, we need to remember that a lot of research has gone on that has changed the way we think about language. English can attach itself to any cultural reality. He quotes Chimimanda Ngozi Adiche’s use of “How did you come out this morning?” as a greeting between people in a book of hers, and says we all know what it means, but that most teachers would not allow that kind of language in the classroom but that we should actually allow language learners the freedom to work by themselves and bring stuff like this in from their communities, expanding English as never before. Holliday moves on to discuss India and how people may speak five different languages, a multi-lingual society. So you become a native speaker not of a particular language but of the whole linguistic repertoire that you use. (Quoting Rajogopolan, 2012) and then a Syrian student who he described as travelling within the language according to her use of it. “You speak the language, not let the language speak you. ….To stamp the language with your identity”(Clements and Higgins, 2008) Holliday thinks that technology allows this sort of thing to come into clear view. Holliday describes coming from your own cultural background and claiming the world, as taking it on in your own terms – a kind of “bottom-up globalisation”. He describes Norton (2014)’s quote “Learner’ – camera – ‘journalist'” – mentioning the questions that were attached with regards to who gives the camera and why do they need to? The internet provides incredible exposure to things across the world. So is there an existing cultural capital that has the resilience to withstand the images from elsewhere? For the picture of Italian learners that Holliday displayed earlier, he thinks yes. He doesn’t believe that anyone lacks cultural capital or identity but that we have to be careful, and this is where the role of the teacher comes in. There is a large role for the teacher in providing social support. As young people are very able to work with new devices, they might not know the strategies this could be used for. He is interested in the ethics, morality and control of using blogs, as discussed in Gollobin (2014). 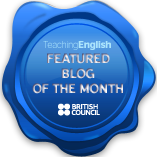 When the students in that study began to blog, they were freed from their identity. They don’t lose anything but they can be whatever they wanted to be. You wouldn’t know age/race/gender/class from their writing. Any newcomers could go on the blog and work out exactly where they should be on the programme and position themselves. Cultural background: national, regional or religious ‘culture’ doesn’t confine you or bind you but provides you with cultural resources. Different people will bring different cultural resources. This explains why somebody in Gollobin’s (ibid) class who has never done blogging before, as soon as they work out the basics of what to do, they knew what to do. They drew on experiences and skills which they could bring to this. But there’s something else there that ties everything together. Universal underling cultural processes. How we all engage with culture everywhere in a similar way, in terms of constructing and engaging with social rules and relationships. Holliday is a cultural traveller when he reads Jane Austen. We are all cultural travellers whenever we go anywhere or read anything. We bring things from our own background that help us to unlock what is happening elsewhere. When you visit the family next door, as a child, that is your first major culture shock. And you have to work out how to be yourself in a completely different domain from what you’re used to. It’s this underlying ability that enables us to travel culturally. All the students referred to earlier in the talk are doing this, but doing it outside the classroom. Holliday thinks that technology should enable use to bring it INTO the classroom. Holliday doesn’t think you need to learn another culture in order to learn another language. You need to recognise existent cultural resources and how they can be used. But there are somethings that get in the way. What? outdated ideas about English and Culture: he has spoken to young people who tells him that their teachers tell them they must speak British English or they won’t be understood. In this day and age, teachers and parents are telling their children/students this. cultural disbelief: we must never believe that people come from somewhere that makes them wired in a way as not to be able to use technology: we mustn’t deny the value of existing experience, it is rich and productive, wherever people come from, whatever their experiences. institutional structures which don’t allow space: they’ve kept the creativity of students hidden and marginalise what can be done with technology. do not get beneath the surface: what we know about society across the world is struggling at the margins because the big narratives tell us that people can’t, when actually people can. We have to learn from the margins. Top down globalisation: the western idea that certain people don’t have autonomy etc. Holliday thinks that we need to be strategically unobtrusive. Language learners are more creative than we imagine, but we don’t see it, then teaching can actually get in the way. Technology puts technology and experience between teacher and student, somehow. Holliday thinks teachers need to step back and let the technology work by itself. 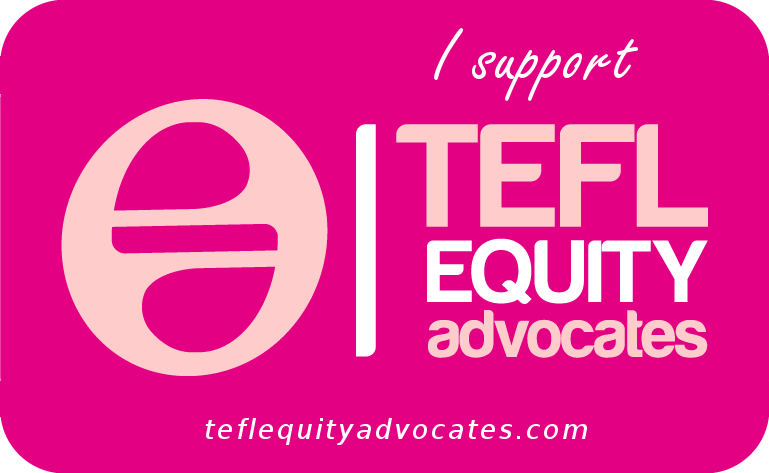 To allow students to be who they want to be and bring what they can from their background. Somehow you have to allow space to be there, which the students can populate in their own terms. So what we mustn’t do is go around telling people how they should behave with technology. Holliday worries about the larger than life language teacher, always there in the middle. He thinks autonomy needs to be de-centred. You need to ask questions without dominating questions and not ask questions which push your agenda. The technology is there, the opportunity is there, people have the wherewithal to stamp their own identity and take things where they want them to go. Q: Do you think the identity is because they are learning a new language and later their identity would in fact be seen in their writing? AH: This wasn’t a matter of removing identity but protecting identity. When you learn a new language you bring your identity into the language and populate it, there is expansion and things move on. But you’ve got to protect peoples’ private choices about what they do with their identity. But I don’t believe that when you learn English, you get a new identity, you expand your existing one into the language. Q. Are emergent and secret forms of learning a threat to the teacher? A.H: Yes I think they are. I think you have to be quite an agile and confident teacher to deal with this sort of thing. The job is shifting from someone who projects a model of the language to someone who facilitates learning. We are asking a huge amount of teachers to be able to field and work with this emergent creativity.Going back to the example of the lang students in Hong Kong, the story goes that the teachers weren’t able to deal with the creativity of the students so used the excuse that cultural background wouldn’t allow them to be creative, so the teachers were using the excuse to protect their domain, have to be very careful. 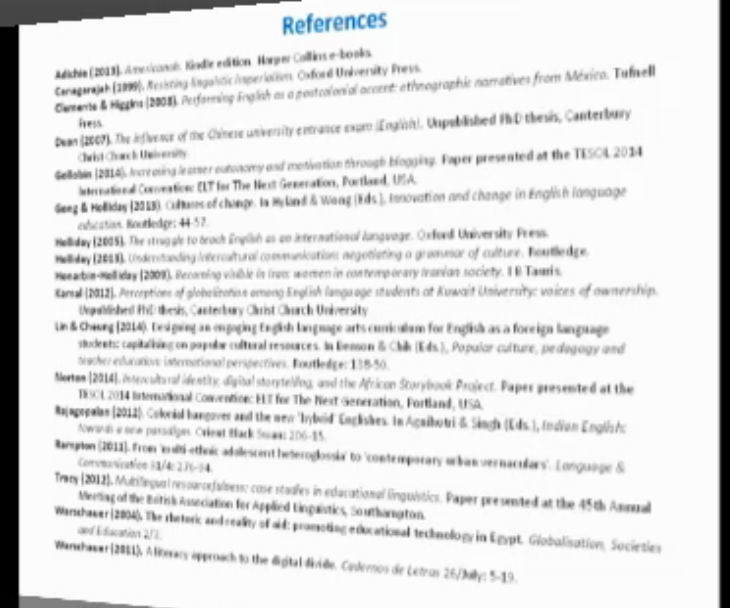 Here is a screen shot of the references slide – not very clear, sorry, but am sure the references will be available elsewhere online anyway! This entry was posted in Conferences, IATEFL 2014 and tagged Adrian Holliday IATEFL 2014, conference, IATEFL 2014, IATEFL Harrogate. Bookmark the permalink. 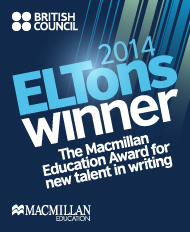 ← IATEFL Harrogate 2014: What *I’m* looking forward to…and how about you? i wonder whether the statement that you parapharse “let technology get on with it” is rather naive, that is the technology is always a designed artifact and so is far from being neutral itself in the way it can open or not open space up for learners?